How exciting!! Finally I have made the decision to start a blog. I have been wanting to do this for a long time as I am a strong believer in sharing information with the world and hopefully receive some feedback. Since this is my first post I think it is in its place to present the program that gave me the idea for this Blog. Google SketchUp has completely changed the way I visualize my ideas, it is truly one of the most ingenious programs I have ever used. First let me explain to you how it works. 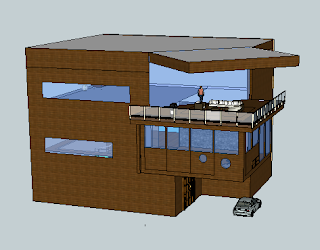 Google SketchUp is a program that lets you easily create a 3d model of whatever is on your mind. That is not a huge innovation in it self but the ingenious thing is that everyone with a computer can use it within I would say 30 minutes. After half a day of playing around in the program I started creating my potential dream house. This is how it ended up. I think it is great, from scratch I have now built a fully functional 3d model of my potential dream house. Also I have tried this on a few other of my business ideas and for the first time in my life I can see the product with my own eyes, it is truly one of the most helpful tools I have acquired in the last year. And the best thing is that it is absolutely FREE! As long as you just want the "basic" version witch I do not find basic at all.